Is Seattle ready for the $18 sandwiches at Dingfelder’s Delicatessen? Brand-new Dingfelder’s Delicatessen on Capitol Hill is already selling a lot of sandwiches that cost, yes, $18. Here’s why Vance Dingfelder says it’s worth it — and what he’s got for you if that’s too rich for your blood. Vance Dingfelder’s defense of this unprecedented-for-Seattle price point is unflinching. “It’s worth it,” he says. “Especially if you look at the amount you’re getting.” His $18 sandwiches are piled high, in the style of a real-deal New York Jewish deli — take a ruler to one, and you’ll measure two inches of meat. Each is overstuffed with 9 or 10 ounces of pastrami or corned beef (or more — sometimes he’ll say, “Listen, I got carried away!”). While the price is not coming down, Dingfelder is listening. To appease those balking at a $20 lunch, he created a “Seattle-style” sandwich — made with half the meat for $12. But Dingfelder says about 95 percent of customers go for the big fat version, with most saving half, happily, for later. Dingfelder’s New York bona fides appear unimpeachable. He grew up on Long Island, then in Brooklyn. His grandfather first took him to delicatessen legend Katz’s when he was 7 years old. He drove a cab in the city for 14 years. He’s an opinionated charmer of the East Coast kind, one of those who understand talking as a pastime, an art, even — on the phone with him, an hour is gone before you know it. His culinary credibility is also the opposite of shabby. He started cooking at age 7, learning from his grandmas, one from Poland, the other from Turkey; one set of grandparents met working at a New York luncheonette. Dingfelder was raised in his dad’s restaurant, an old-school ice-cream parlor serving diner fare; his dad, he claims, brought the Monte Cristo sandwich east from Las Vegas. 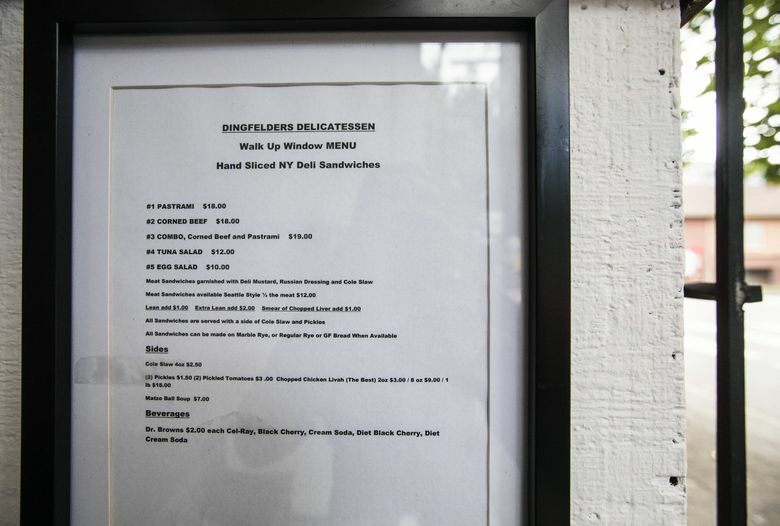 When he was 13, the two of them redesigned the menu together. 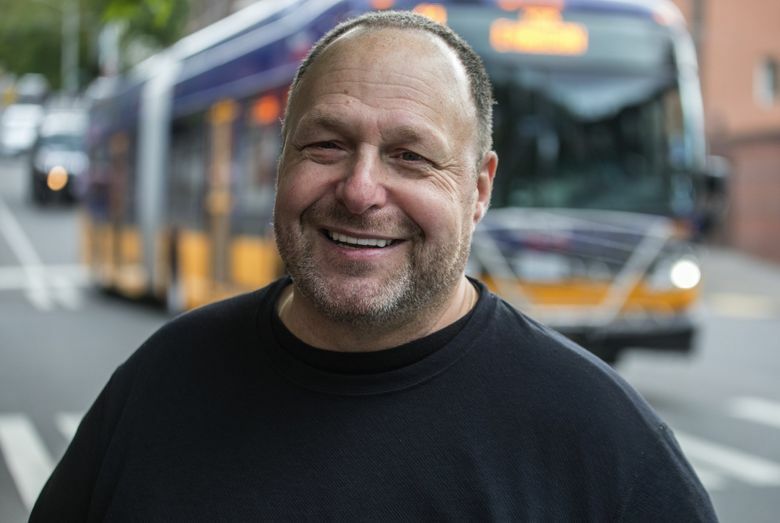 Out west since 1992, Dingfelder worked for a food-service distributor for 15 years, then as food-and-beverage GM at a Redmond sports club. His company Nourish Catering was born from running a deli fundraiser night at Bellevue’s Temple De Hirsch Sinai. “What do I really want to do?” he was asking himself. “My rabbi says to me, ‘Hey, you know, you should be the temple caterer.’ I thought, if God wants me to be a caterer …” They let him use the kitchen, and the business grew by word-of-mouth. Eventually, the question became: “Why don’t you do a deli?” Now, there is Dingfelder’s. But bona fides do not necessarily a great sandwich make. And it’s necessary that an $18 sandwich be great. I ATE HALF a Dingfelder’s New York-style corned beef sandwich and then tried, unsuccessfully, to eat half a Seattle-style pastrami in the same sitting. The rye is made to Dingfelder’s specifications by local Blazing Bagels; he thinks Blazing does a good job (caveat: “in this city”), and he’s pleased with the bread (good crust, “a nice chew,” stands up to the meat-load). Russian dressing, deli mustard and coleslaw are added automatically, for those unfamiliar with how to order a sandwich like this. Meats are, controversially, thick-sliced (a practice about which Dingfelder will gladly discourse). Dingfelder’s corned beef is beautifully rosy — soft with melty fat, maybe a slight scent of cloves, so rich it’s almost sweet. The tang of the dressing rings perfectly, while the slaw remains mostly conceptual, with the mustard only occasionally calling attention to itself. A second test sandwich was far leaner — Dingfelder says you can, and should, specify how you want it. Either way, it’s a hell of a sandwich. 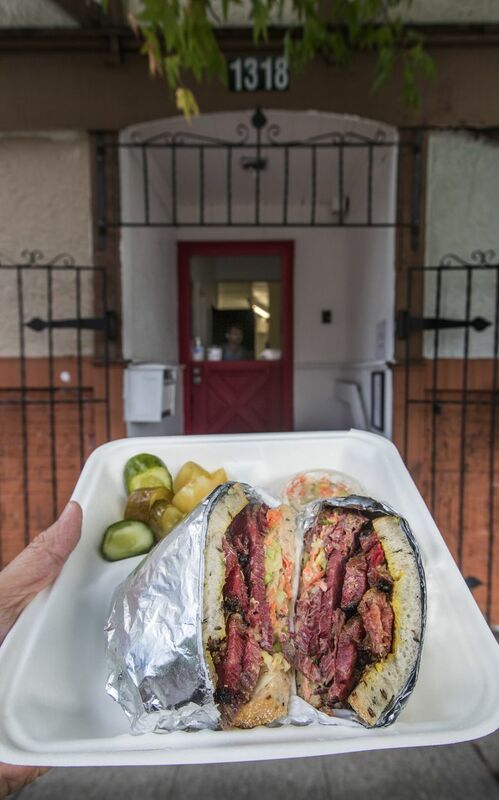 The pastrami may be even better: shades of deep maroon, strata of buttery fat, blackened end-bits. It, Dingfelder reveals, is made off-site. Would he care to say where? “I can’t,” he responds. 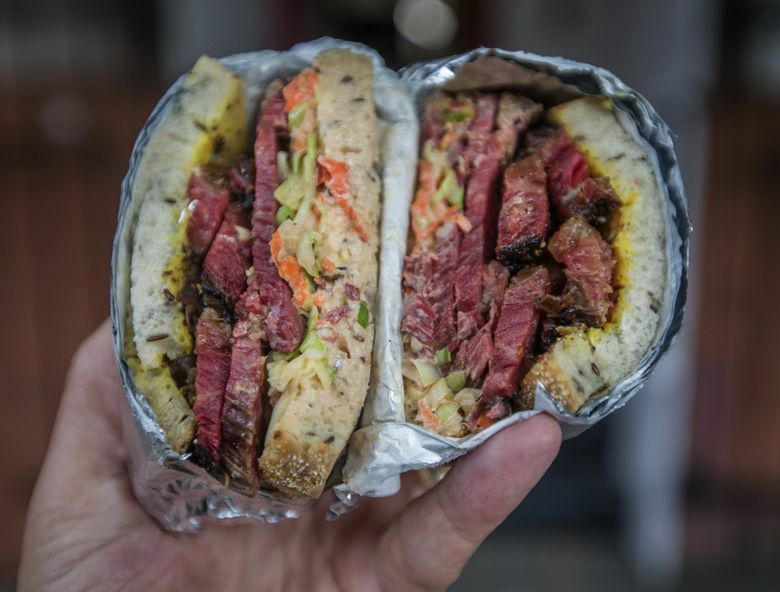 “It’s that New York style and flavor,” he hints about this secret pastrami. With your sandwich, you get a few bits of also secretly sourced, perfect pickle (squeaking in your teeth, waking up the sides of your tongue), plus the rarity that is pickled tomato (super crunchy with a sinus-tingling zing). You should, ahem, get more than the tiny cup of coleslaw. You can, and probably should, add a smear of chopped liver for $1. In another controversial choice, the matzoh ball soup ($7 per 16-ounce container) is thick and chickeny rather than clear-brothed — I loved it, but found my tennis-ball-sized matzoh ball dense and gummy (Dingfelder will surely take umbrage). Split pea (same price) is a tasty, oddly carrot-forward puree. An albacore tuna-salad sandwich ($12) with gorgeous heirloom tomatoes had enough tuna squishing out the sides to maybe make another sandwich. Tongue wasn’t on the menu when I was there — Dingfelder says it’s kind of a backdoor thing. “You want tongue, I got tongue!” he laughs. On Friday and Saturday nights, there’s corned beef hash with a sous-vide egg ($11), served until 3 a.m.
“This,” if all goes according to plan, involves a Katz’s-type deli and, as they say, much, much more. Dingfelder also wants to offer the kinds of goodnesses found at New York’s Russ & Daughters, as well as knishes and other treats like those at Yonah Schimmel’s. Sunday-Thursday 11 a.m.-7 p.m., Friday-Saturday 11 a.m.-3 a.m.